This is an updated design of the BSTS. 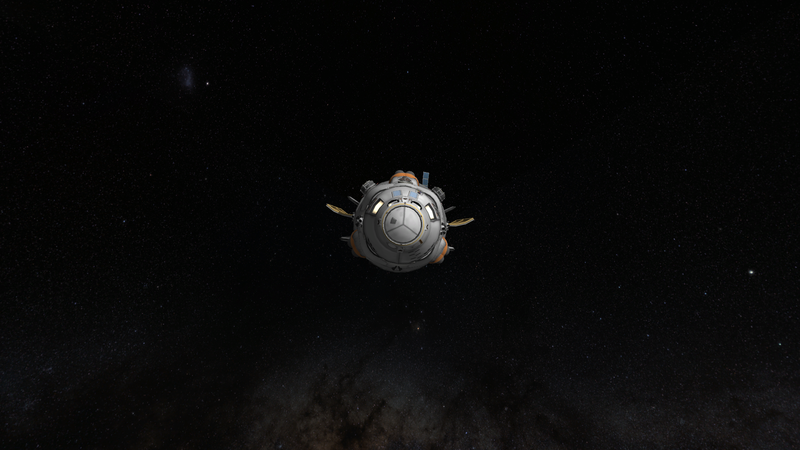 The upgrades allow Kerbals to ingress/egress out of the bottom of the biconic reentry vehicle. This file also includes the landing module used to give the BRV enough dV to land and take off from the Mun and Duna (haven’t yet tested on other planetary bodies with an atmosphere). The update also reduces the cosine losses in dV from the previous version’s large angle of attachment on the engines. Original description below. Presenting the Biconic Space Transportation System (BSTS). This crew module is built upon a modular design of a biconic reentry vehicle. It’s natural lifting body design allows control with the body flap and reduced heating during reentry. Although this craft does produce a considerable amount of lift, DO NOT EXPECT TO GLIDE. Since this command module can be stacked, the overall design allows for a modular system to be built around this vehicle. The craft itself is propelled by 6 Thud engines with a total of ~1400 m/s of dV. The BSTS is equipped with backup parachutes; however, these parachutes were meant as a last resort and will not slow the craft down enough to land without propulsive assistance but the parachutes WILL save your crew. This spacecraft is designed to land propulsively, anywhere…say on top of the VAB? To land this craft successfully, once you get near the ground, ~1500m, use the vernor engines to flip the craft to allow your engines to guide your descent. The forward vernor engines can be toggled with the number 1 action group. Best of luck to you in your adventures, and I hope you enjoy this innovative Biconic Reentry Vehicle. A stock aircraft called BRV with Landing Module. Built with 239 of the finest parts, its root part is dockingPort2.